We’re thrilled to announce that Makers Empire is celebrating 1 million maze runs played in its new Maze Mania game after its launch just over four weeks ago. 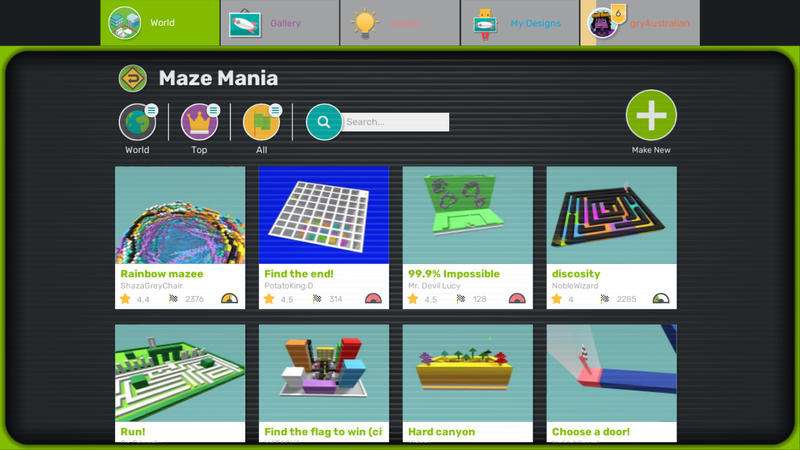 Maze Mania is the first of a series of new game creators that live in the Game Zone inside Makers Empire’s popular Makers Empire 3D design app. In Maze Mania, users are encouraged to create their own challenging 3D mazes. Once a user has finished designing a maze, they can invite other users to try to find their way successfully through the maze. Users then compete to finish the maze in the shortest time possible, with the top players being displayed on each maze’s leaderboard. Similarly, Hajnalka Molloy, Leader of Library and Information Services at Aberfoyle Park Primary School Campus in Australia, says her students are also loving Maze Mania. “I had thirty kids burst through the doors at lunchtime to get to Makers Empire… I only have 30 laptops in there!” she commented. Keen to try Maze Mania yourself? Makers Empire 3D can be used at school or at home. Download the free Makers Empire 3D app or visit your device’s app store and then visit the Game Zone.